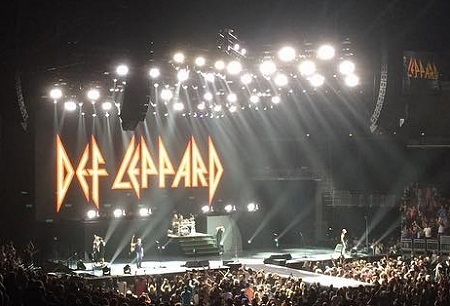 Def Leppard played another show on the 2017 North American Tour last night in Louisville, KY with 17 songs performed. The show took place at the 17,500 capacity KFC Yum! Center. 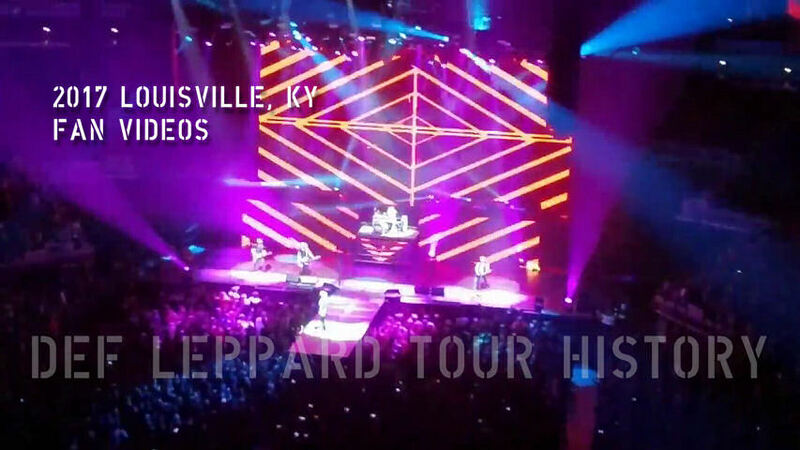 The band's first time in Louisville, KY since 3rd September 2015 on the 2015 world Tour. The ninth show the band have played in Louisville and the second time at this venue. The first visit to Louisville was in May 1983 at Louisville Gardens during the Pyromania tour when Joe got up on stage with the support act Jon Butcher Axis. They returned for an In The Round show in January 1988 on the Hysteria tour at Freedom Hall with Tesla in support. A second In The Round show followed in November 1992 on the Adrenalize tour at the same venue. After an eight year gap they were back at that venue in August 2000 on the Euphoria tour. They returned to Louisville Gardens on the next visit in October 2005 on the Rock Of Ages tour with Cheap Trick/Ricky Warwick. The next show took place in August 2007 on the Downstage Thrust tour followed by another Freedom Hall show in August 2011 on the Mirrorball tour. Their first show at KFC Yum! Center took place in September 2015 just under two months before the release of the current studio album. 17 songs were played at last night's show. All 3 new album songs were played in Louisville for the first time. Joe picked up a bra thrown onstage at one point during the show - as captured in the fan photos. "Louisville, Kentucky. Thanks for coming. Thanks for having us. Thanks for being here. We'll see you next time. Goodnight." The next show takes place on 27th April in Nashville, TN. Played for the first time in Louisville.